Al “Two Gun” Gettel pitched in 184 major-league games over the course of seven seasons between 1945 and 1955. The 6-foot-3 right-hander was frequently traded or sold during his career, pitching for six franchises: the New York Yankees (1945-1946), the Cleveland Indians (1947-1948), the Chicago White Sox (1948-1949), the Washington Senators (1949), the New York Giants (1951), and the St Louis Cardinals (1955). Nicknamed “Two Gun” late in his career for his appearances in several television and movie Westerns, Gettel was a standout in the Pacific Coast League during a long tenure with the Oakland Oaks (1949-1955) and a brief stint with the San Diego Padres (1956). He also excelled during his one offseason pitching in the Cuban Winter League for the pennant-winning Habana Baseball Club (1952-1953). Altogether Gettel pitched in professional baseball for 22 seasons, beginning in 1936 for his hometown Norfolk Tars of the Piedmont League and finishing his career at the age of 41 with the Asheville Tourists of the Sally League in 1959, after a two-year absence from Organized Baseball. Allen Jones Gettel was born in Norfolk, Virginia, on September 17, 1917, to Edward A. and Sarah F. (Jones) Gettel. He was raised on the farm of his maternal grandfather, Nathaniel Jones, in Kempsville, Virginia, in rural Princess Anne County just outside the city of Virginia Beach. Gettel attended Kempsville High School and was signed as an 18-year-old by the New York Yankees in 1936. The Yankees assigned the young right-hander to their Class B Piedmont League affiliate in Norfolk. Over the next nine seasons, Gettel pitched successfully for seven different Yankees minor-league affiliates, garnering at least a .500 winning percentage in every season except his 1936 rookie year, when he was 0-1. A pitcher with as accomplished a minor-league pitching record as Gettel’s 93-64 (101-70 from 1936 through 1944) would have almost certainly gotten an opportunity at the major-league level in any other organization, but cracking the big-league roster of the Yankees during their late 1930s and early 1940s dynasty was an almost uniquely difficult task. The Joe McCarthy-era dynamic Yankees lineup of hitters was complemented by a pitching staff that included the likes of Red Ruffing, Lefty Gomez, Johnny Murphy, Monte Pearson, Spud Chandler, Atley Donald, and Tiny Bonham. The Yankees and their manager, Joe McCarthy, finally gave Gettel an opportunity to pitch in the major leagues in 1945. The pitching staff had been severely depleted during the 1944-1945 offseason by the draft call-ups of several pitchers.4 McCarthy employed the 27-year-old rookie as a starter and middle reliever on a fourth-place Yankees team that finished 6½ games behind Detroit. Gettel had a solid rookie year, compiling a 9-8 record with a 3.90 ERA. He displayed his characteristic control on the mound in 1945, walking a mere 53 hitters in 154⅔ innings.5 In 1946 Gettel continued to take advantage of his opportunity at the major-league level, posting a strong 2.90 ERA with a tough-luck 6-7 record in 11 starts and 26 total appearances on a Yankees team in transition. Gettel’s ascension to the Yankees came at a time of regime change for the organization. In January 1945 the estate of Jacob Ruppert sold the club to Dan Topping, Del Webb, and Larry MacPhail. Sixteen months later, in May 1946, manager Joe McCarthy resigned because of poor health and pressure from the new owners to return the Yankees to the top of the American League standings. The 1948 season proved to be a much different one for Gettel. The 30-year-old pitcher got off to a rough start for the upstart 1948 Indians, who found themselves one game out of first place on Memorial Day. In five appearances, he had a 0-1 record with a 17.61 ERA. He started two games and lasted a combined total of four innings, surrendering eight earned runs. On June 2 the Indians dealt Gettel and outfielder Pat Seerey to the White Sox for outfielder Bob Kennedy. Gettel continued to slump in June and July 1948 for the soon-to-be 101-loss White Sox, who used him primarily as a starter. On August 1 Gettel’s record stood at 2-7 with a much improved, though hardly impressive, 6.13 ERA. In the final months of the season, Gettel turned things around considerably, winning six of his last ten decisions and finishing with an 8-11 mark and a 4.01 ERA.7 Gettel got his only career opportunity to field a position other than pitcher on July 22, 1948, filling in at second base for four innings following the ejection of Cass Michaels in the second game of a doubleheader against the Red Sox. Gettel handled all three of his fielding opportunities cleanly and earned three assists in a 5-3 defeat.8 Gettel’s baseball talents off the mound also included unusual skill at the plate for a pitcher. He compiled a .228 career batting average. During the 1949 season, Gettel struggled as both a starter and a middle reliever for the White Sox before being sold to the Washington Senators on July 12. His difficulties on the mound continued and Washington sold him to the Oakland Oaks of the Pacific Coast League on August 15. At that time he had a 2-7 record and an unhealthy 6.08 ERA. In Oakland Gettel found his longest and most successful home as a player. He excelled against the Triple-A competition, going 4-0 with a 3.62 ERA in 12 appearances for the Oaks in the waning days of the 1949 season. 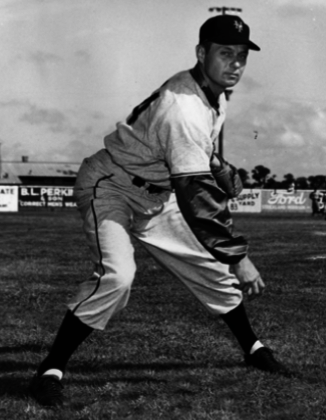 He re-signed with the Oaks for the 1950 season and enjoyed his most successful season as a professional pitcher. Gettel went 23-7 with a 3.62 ERA for the PCL champion Oaks, earning him the first of his three spots on the PCL All-Star Team. In 1955, at the age of 37, Gettel had his final major-league stint, with the St. Louis Cardinals, who had purchased him from the Oaks. He went 1-0 with an ERA of 9.00 in eight appearances in August and September. Gettel finished his major-league career with a 38-45 record and a 4.28 ERA. He played his last season in the Pacific Coast League in 1956 with the San Diego Padres. Gettel then worked briefly as a coach for Oakland and continued to pursue an acting career. He returned to professional baseball briefly in 1959, pitching in five games for the Asheville Tourists of the Sally League. After his baseball career he returned to his family farm in Kempsville, Virginia. In addition to farming, he operated a machine shop and worked in construction.14 Gettel died on April 8, 2005, in Norfolk, Virginia, at the age of 87. He is buried in the Emmanuel Episcopal Church Cemetery in Kempsville (now incorporated into the city of Virginia Beach). This biography appears in "The Team That Time Won't Forget: The 1951 New York Giants" (SABR, 2015), edited by Bill Nowlin and C. Paul Rogers III. It also was published in "From Spring Training to Screen Test: Baseball Players Turned Actors" (SABR, 2018), edited by Rob Edelman and Bill Nowlin. 1 Joshua Harris Prager, “Was the ’51 Giants Comeback a Miracle, Or Did They Simply Steal the Pennant?” Wall Street Journal, January 31, 2001. 2 Prager; “Evidence Supports Belief that Giants Stole Pennant,” Los Angeles Times, February 1, 2001. 4 Dan Daniel, “Yankees Lineup Looks Formidable, but Draft Calls Make It Vulnerable,” The Sporting News, March 29, 1945, 4. 5 “Official A.L. Pitching Records,” The Sporting News, December 27, 1945, 11; Ken Smith, “Lippy Waves Hand and Produces New Gateway Guardian,” The Sporting News, January 31, 1951, 7. 7 Bob Burnes, “Tough Luck Story of the Year: Al Gettel,” The Sporting News, October 13, 1948, 12. 8 “Pitcher Gettel at Second,” The Sporting News August 4, 1948, 30. 9 “Pacific Coast League,” The Sporting News, August 5, 1953, 24. 10 The Oaks won the PCL playoffs. 11 “Gettel Switches Starts, Stopped on 8 Game Streak,” The Sporting News, August 5, 1953, 23; “Pacific Coast League,” The Sporting News, August 11, 1954, 26. 12 “Pacific Coast League,” September 22, 1954, The Sporting News, 34. 13 “Tuning In,” The Sporting News, August 17, 1955, 15. 14 Stephen Miller, “Al Gettel, 87, Pitcher for Yankees and Giants,” New York Sun, April 27, 2005.